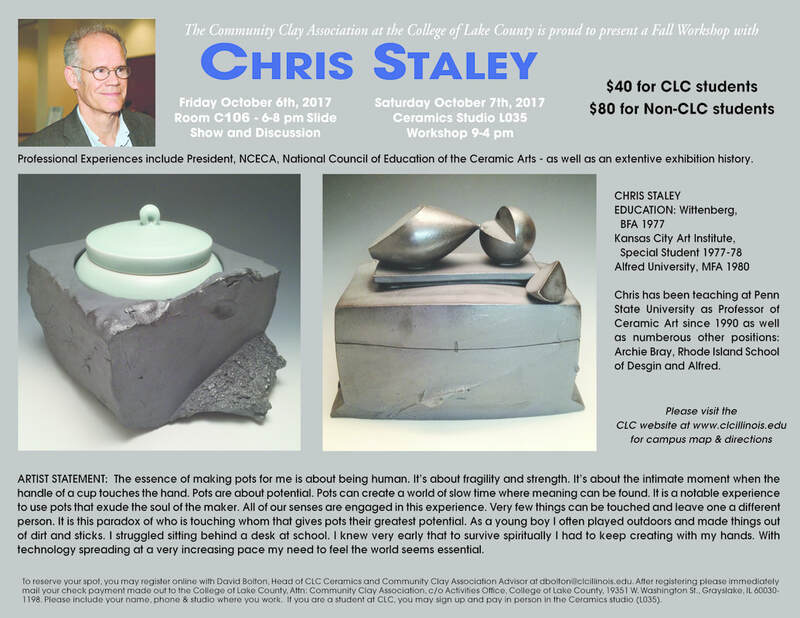 ﻿﻿﻿﻿﻿﻿﻿﻿﻿﻿The purpose of this site is to share information about my work, ceramics, the College of Lake County Ceramics Program, and events sponsored by CLC Ceramics as well as the Student Ceramics Club. we have a Ceramics Sale and a Visiting Ceramic Artist Workshop every Fall and Spring semester. In addition there are ceramics exhibitions held annually in the CLC Gallery. At the College of Lake County we offer a strong foundation in handbuilding, throwing, surface decoration, and glazing in the Ceramics I (art226), Ceramics II (art 246), and Ceramics III (art 247) classes. in the summer we offer Atmospheric Firing (wood and soda firing-art267). All of these events and programs add to the learning experience at CLC. Please scroll down to view upcoming Ceramics events at CLC . 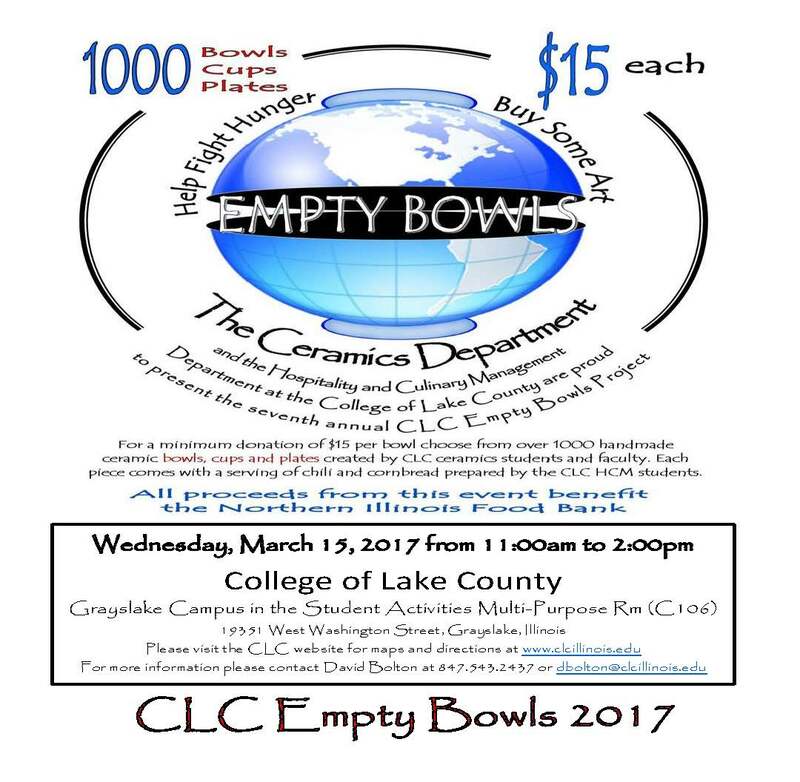 The Ceramics Department and the Hospitality and Culinary Management Department at the College of Lake County are proud to present the 10th annual CLC Empty Bowls Project Wednesday March 13, 2019 from 4 to 7pm in the Multi-Purpose Room C106 (Grayslake campus). For a minimum donation of $15 per piece choose from over 1000 handmade ceramic bowls, cups and plates created by CLC ceramics students and faculty. Each piece comes with a serving of chili and cornbread prepared by the CLC HCM students. All proceeds benefit the Northern Illinois Food Bank and for the first time the CLC Share Market. For more information or to be added to our e-mail list contact David Bolton at dbolton@clcillinois.edu or join the CLC Community Clay Association Facebook Group to hear about future events. ​April 3 and 4, 2019: Wednesday 10am to 9pm, Thursday 7:30am to 7pm. The Ceramics Sale will be held in the CLC Robert T. Wright Gallery in the LRC/Library. Please come and support the CLC Ceramics students as they raise funds for the visiting artist program, field trips, scholarships, and new equipment for the ceramics studio. Ceramics has sold over $180,000 worth of student and faculty art work in the Ceramics Sale from the Fall 2006 semester to the Fall 2018 semester . Thank you for your continued support as our students gain valuable experience selling and marketing their work. Saturday April 6, 9am-4pm Workshop in Ceramics Studio L035. Why so cheap? 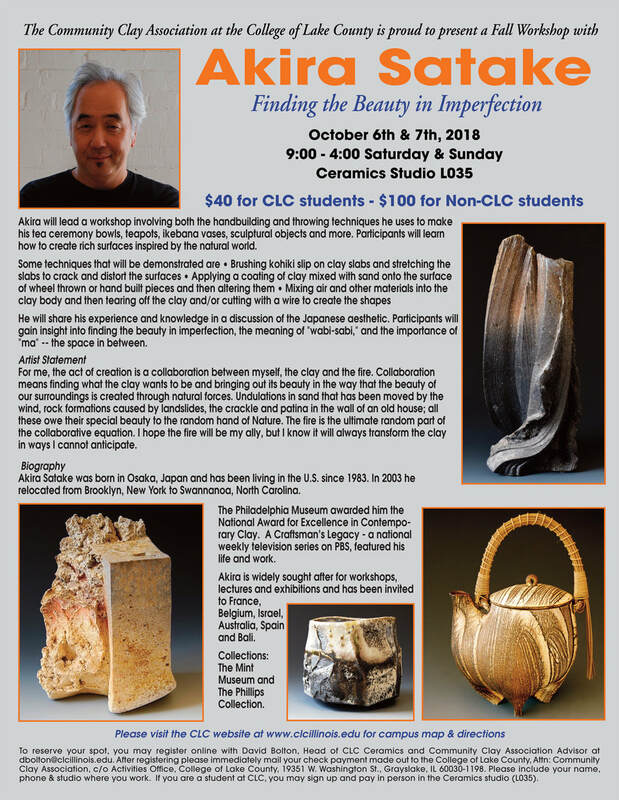 Cost for the workshop is subsidized by funds from the CLC Ceramics Sale and Student Activities. This workshop will focus primarily on developing throwing and decorating skills. We'll cover techniques for repeating, joining, and altering functional forms as well as adding surface decoration with texture, slip, glaze, and commercial underglaze. These techniques can be applied to all types of firing methods and temperatures. Discussions about aesthetics, studio life, and business development will be ongoing throughout the workshop. in the CLC Ceramics Studio (L035). $40 for CLC students, $100 for non-CLC students. Akira Satake will lead a workshop involving both the handbuilding and throwing techniques he uses to make his tea ceremony bowls, teapots, ikebana vases, sculptural objects and more. The Ceramics Department and the Hospitality and Culinary Management Department at the College of Lake County are proud to present the 9th annual CLC Empty Bowls Project Wednesday March 7, 2018 from 4 to 7pm in the Multi-Purpose Room C106 (Grayslake campus). For a minimum donation of $15 per bowl choose from over 1000 handmade ceramic bowls, cups and plates created by CLC ceramics students and faculty. Each piece comes with a serving of chili and cornbread prepared by the CLC HCM students. All proceeds benefit the Northern Illinois Food Bank. For more information or to be added to our e-mail list contact David Bolton at dbolton@clcillinois.edu or join the CLC Community Clay Association Facebook Group to hear about future events. Please come and support the CLC Ceramics students as they raise funds for the visiting artist program, field trips, scholarships, and new equipment for the ceramics studio. Ceramics has sold over $150,000 worth of student and faculty art work in the Ceramics Sale from the Fall 2006 semester to the Fall 2017 semester . Thank you for your continued support as our students gain valuable experience selling and marketing their work. 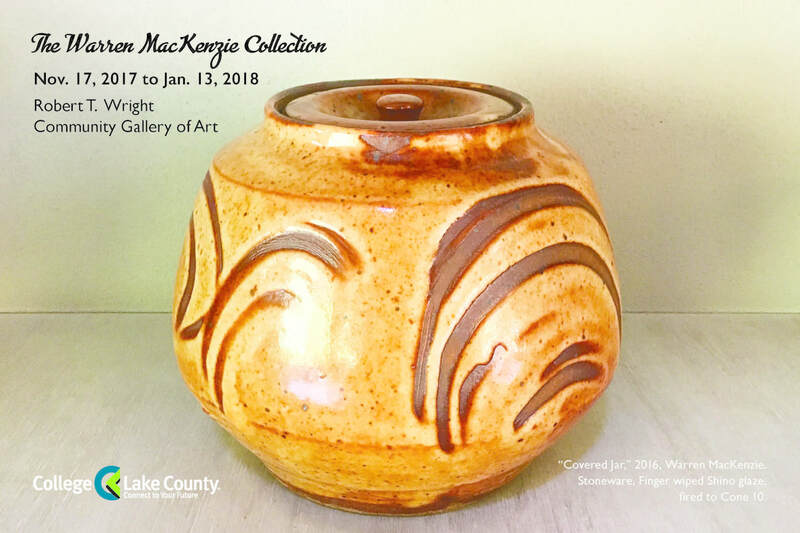 More than 60 ceramic art pieces created by world-famous potter Warren MacKenzie will be on display at the College of Lake County Robert T. Wright Community Gallery of Art from Nov. 17, 2017 to January 13, 2018. 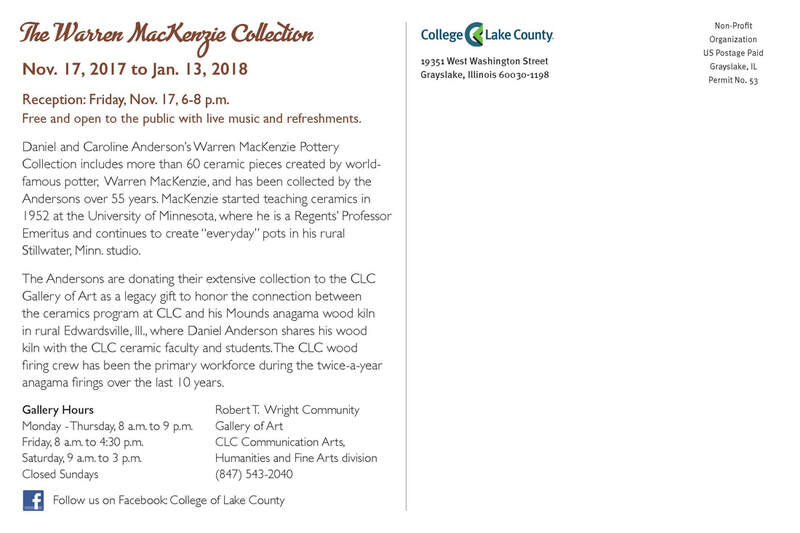 An opening reception for Daniel and Caroline Anderson’s Warren MacKenzie Collection will take place from 6-8 p.m. Friday, Nov. 17, and is free and open to the public with live music and refreshments. The exhibit’s pieces have been collected by the Andersons of Edwardsville, Ill. over 55 years. MacKenzie was born in 1924 and grew up in Wilmette, Ill. and attended New Trier High School in Winnetka. MacKenzie started teaching ceramics in 1952 at the University of Minnesota, where he is a Regents’ professor emeritus and continues to create “everyday” pots in his rural Stillwater, Minn. studio. The Andersons are donating their extensive collection to the CLC Gallery of Art as a legacy gift to honor the connection between the ceramics program at CLC and his Mounds anagama wood kiln in rural Edwardsville, Ill., where Daniel Anderson shares his wood kiln with the CLC ceramic faculty and students. The CLC wood firing crew has been the primary work force during the twice-a-year anagama firings over the last 10 years. Anderson taught ceramics for 32 years at SIU-E, where he serves as emeritus professor. One of his students was Ben Bates, a CLC ceramics instructor and lab assistant. Over the years, the two ceramics programs have forged tight bonds, sharing creative expertise and equipment. March 10 & 11, 2017 Friday Evening 6-8pm slide show (C003) and Saturday Workshop 9-4 (L035). April 4 and 5, 2017: Tuesday 10am to 9pm, Wednesday 7:30am to 7pm. 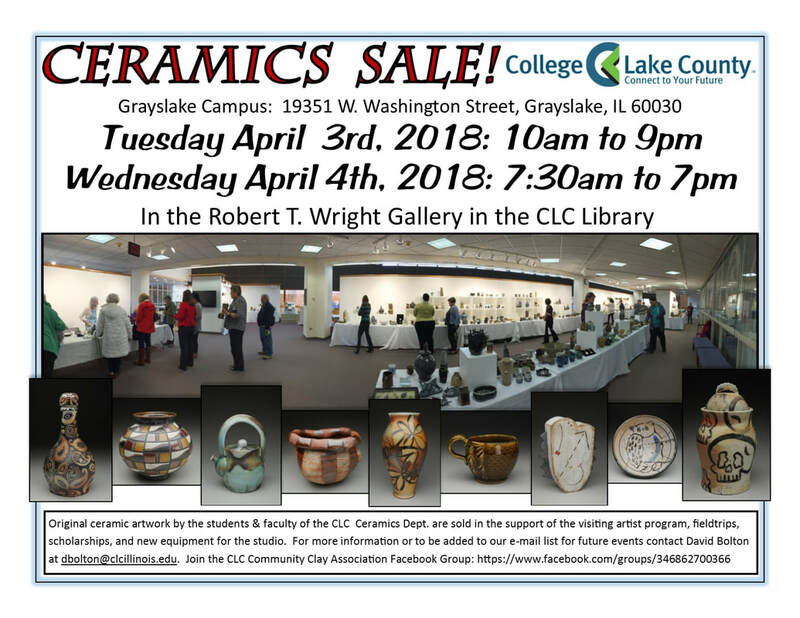 The Ceramics Sale will be held in the CLC Robert T. Wright Gallery in the LRC/Library. Please come and support the CLC Ceramics students as they raise funds for the visiting artist program, field trips, scholarships, and new equipment for the ceramics studio. Ceramics has sold over $140,000 worth of student and faculty art work in the Ceramics Sale from the Fall 2006 semester to the Fall 2016 semester . Thank you for your continued support as our students gain valuable experience selling and marketing their work. November 15&16th, 2016: Tuesday 10am to 9pm, Wednesday 7:30am to 7pm. The Ceramics Sale will be held in the CLC Robert T. Wright Gallery in the LRC/Library. Please come and support the CLC Ceramics students as they raise funds for the visiting artist program, field trips, scholarships, and new equipment for the ceramics studio. Ceramics has sold over $130,000 worth of student and faculty art work in the Ceramics Sale from the Fall 2006 semester to the Spring 2016semester . Thank you for your continued support as our students gain valuable experience selling and marketing their work. April 5-6th, 2016: Tuesday 10am to 9pm, Wednesday 8am to 7pm. 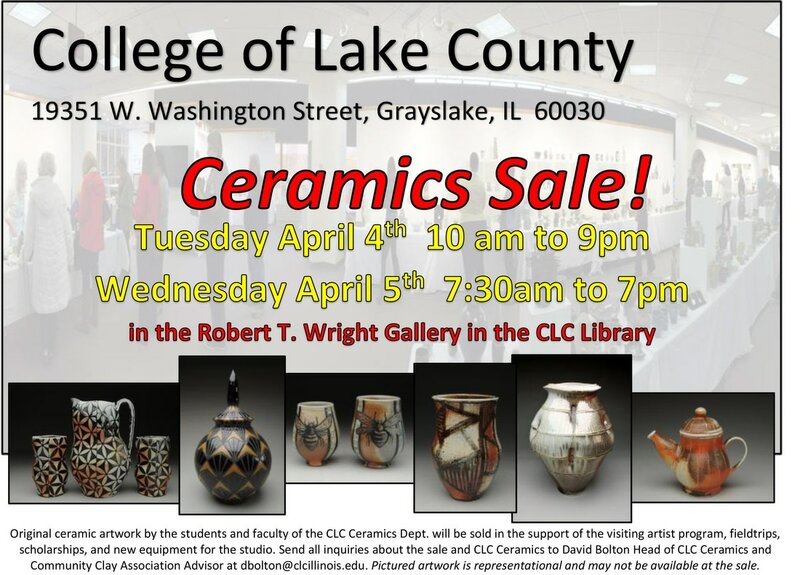 Due to construction, the Ceramics Sale will be held in the CLC Robert T. Wright Gallery. Please come and support the CLC Ceramics students as they raise funds for the visiting artist program, field trips, scholarships, and new equipment for the ceramics studio. Ceramics has sold over $100,000 worth of student and faculty art work in the Ceramics Sale from the Fall 2006 semester to the Spring 2014 semester . Thank you for your continued support as our students gain valuable experience selling and marketing their work. Seven diverse art exhibitions of paintings, clay, sculpture, photography and more are planned for the 2015-16 season at the College of Lake County’s Robert T. Wright Community Gallery of Art. The exhibits feature work by well-known Chicago area artists as well as exhibits by members of the gallery, CLC faculty and students. All opening receptions are free and open to the public and include live music and refreshments. Due to construction, please park in Lot 1 on the north side of campus and enter through the Technology Building entrance (T1). Terry Dixon: Lines, Patterns and Images, Aug. 21 to Oct. 4. Dixon, a CLC full-time art professor, juxtaposes photographic images with acrylic paint, oil pastels and ink, creating an interesting marriage between traditional studio techniques and digital media. Combining the various media allows the surface of his work to take on different depths so that the viewer’s eye is drawn into not just one area of the artwork, but to many different angles. Dixon’s artwork reflects his interest in communicating societal and political issues, African art and culture and abstract expressionism and is fueled by his love for jazz and electronic music. Reception: Friday, August 28, 6-8 p.m. Recent Works: A Juried Competition, Oct. 9 to Nov. 15. The 35th annual competition includes all fine art media and is open to all artists who live or work in Lake County. Approximately $2,000 will be awarded in cash prizes and purchase awards for the college’s art collection. Reception: Friday, October 9, 6-8 p.m.
China: Foreign Reality: Nov. 20 to Jan. 10. David Bolton, Terry Dixon, Hans Habeger, Robert Lossmann, Roland Miller and Erick Rowe. Art department faculty members traveled to China on a U.S. State Department grant in 2014 to share American culture with Chinese university students. The faculty presented lectures and exhibited their work and their students’ work South China Normal University and Guangzhou University in Guangzhou and Xi’an International University in Xi’an. Their artwork describes a still emerging “super nation” with both third world and cutting edge technologies and ancient and modern cultures. Reception: Friday, November 20, 6-8 p.m.
Members Exhibition: January 15 to February 21. Enjoy a diverse group show composed of all types of fine art, created by Lake County artists who are members of the gallery. Reception: Friday, January 22, 6-8 p.m.
Brad Coleman: Drawings, Feb. 25 to March 26. Reception: Friday, February 26, 6-8 p.m.
CLC Student Art Competition: April 7 to May 8. A juried exhibit by current CLC art students featuring painting, drawing, computer graphics, photography, ceramics, jewelry, digital media and sculpture. Approximately $1,200 will be presented in cash prizes and purchase awards. The Lake County Art League will sponsor a $500 scholarship. 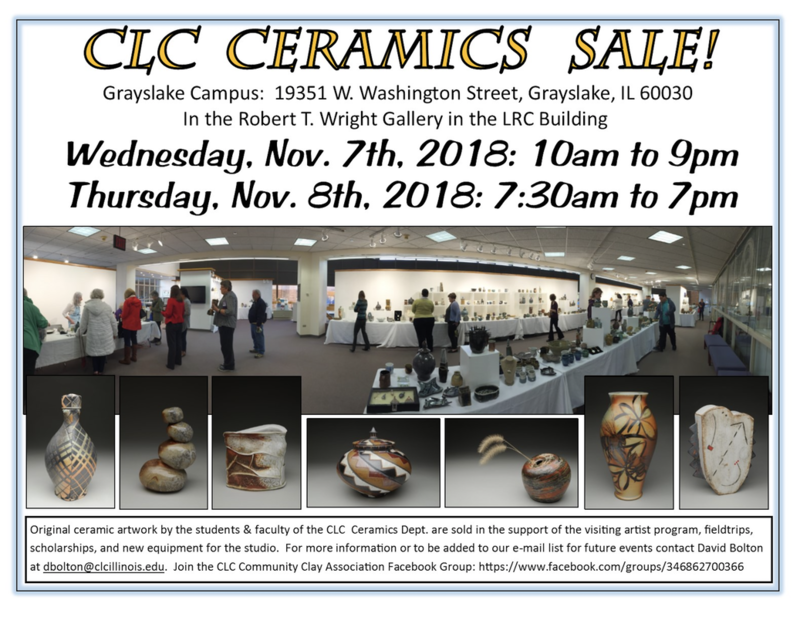 Reception: Friday, April 8, 6-8 p.m.
CLC Ceramic Art Sales will be held at the Grayslake campus on Nov. 17-18 and April 5-6, featuring works created by CLC faculty and students. For more information, call the Communication Arts, Humanities and Fine Arts division at (847) 543-2040 or visithttp://gallery.clcillinois.edu/. Gallery hours: Monday-Thursday, 7:30 a.m. to 9 p.m.; Friday, 8 a.m. to 4:30 p.m.; Saturday, 9 a.m. to 3 p.m.; closed Sundays. Hours vary during college breaks and between semesters.